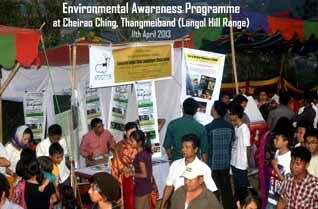 An environmental awareness programme was organized by North East Centre for Environmental Education and Research (NECEER), Imphal in association with For a Better Manipur (FBM) and Youth Street News (YSN) at Cheirao Ching, Thangmeiband on 11th April2013, the Manipuri New Year Day, Cheiraoba.The programme was organized to create awareness among the public about the need of conserving Langol Hill Range and Lamphelpat. Pamphlets were distributed and posters were displayed during the event.Khuraijam Jibankumar, founder of NECEER,Imphal interacted with the public and made the public alert about the consequences that will be resulted from the degradation of Langol Hill Range and Lamphelpat. Adhikarimayum Aisho, co-ordinator of NECEER Environmental Awareness Programme appeal to the public not to cut trees instead plant more trees in the hill range and not to throwplastic waste inside the reserve forest. During the awareness programme, NECEER, Imphal promoted 2nd Enviro Youth Summit of Manipur which is going to be held at Lamyanba Shanglen on 26th and 27th April 2013 and urged the youths to participate it. The youth summit aimed to encourage students to make aware of the environmental issues of the state and create leadership qualities among the students. As part of the summit, painting competition (Std. I-VI), symposium (VII-XII), short story writing contest (BA & BSc students), nature walk at Kangla Fort and screening of environmental films will be organized. Actress Bala is the brand ambassador of the summit.